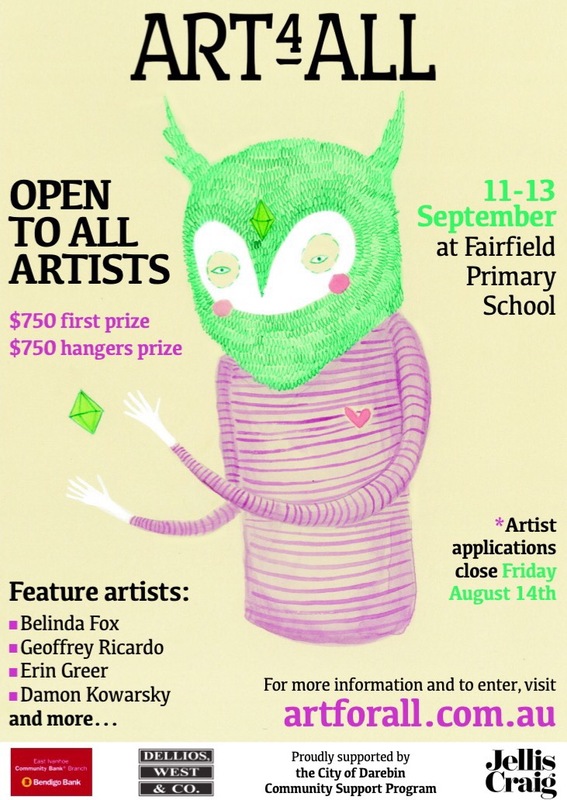 Do you know any artists that might like to enter works in our school art show this year? Here’s the poster! We are recruiting for the next week or so, and then applications close! Or would you like to come along to Art4All? You should! Save the date, 11-13 September. Come along on Friday night from 6-9pm and be first in line to buy art. Art4All always has interesting and fabulous art for sale. Maybe an elephant sculpture by Geoffrey Ricardo? We’re having a smaller one this year in the playground. Or an etching by Damon Kowarsky? Or a pencil and watercolour work by Marianna Marx? Or one of Erin Greer’s little animals (she is the artist in residence this year and it is her lovely artwork on our publicity material). Come along on Saturday from 10am til 3pm for a low key browse/buy. Check out the gallery and gallery shop and have a coffee and cake in the cafe. Or what about coming along to the gala opening on Saturday night? From 7pm. Enjoy canapés and drinks, entertainment (there’s a string quartet this year), our annual chair auction and support the artists that win prizes, all whilst surrounded by fabulous art. And really and truly, if you’ve got kids who like crafty stuff, Sunday is unreal. Really unreal. Really and truly! 5 hours of art, craft and performance workshops for only $15. I love Art4All! But it’s a big job to organise. Luckily there’s a great team of people on the job this year.